Thursday join me at the government center (room 104) from 5 – 7 PM to discuss this concept. I encourage you to bicycle to the meeting if you are so able; and then join me on a ride through the Kutzky Park Neighborhood to Cascade Lake Park at 7 PM. June 16, 2006 was a sad day for Rochester. At an intersection that was designed unsafe for pedestrians, a young girl lost her life when she was hit by a careless driver. In the 10 years since this happened Rochester & Olmsted County have done almost nothing to improve pedestrian & bicyclist safety in this area. Thank you to Andy Masterpole & Mark Miller of SEH for their volunteer efforts in putting these conceptual materials together. Also thanks to many members of BPAC & We Bike Rochester for providing suggestions and encouragement that factored into these recommendations. The best part of this is that most of these improvements are low cost, address other issues like neighborhood speeding and unsafe crossings, and can be implemented on a trial basis. Our goal is to deliver improved bicycle and pedestrian safety to the thousands of people that live in the Country Club Manor & Meadow Lakes areas. We are proposing a pedestrian bridge and a number of on street improvements to safely connect neighborhoods on the West side of West Circle Drive. 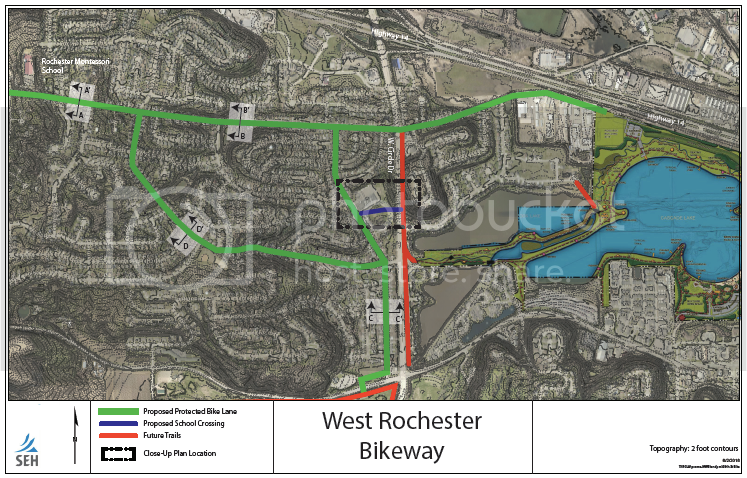 The proposed improvements will provide connections between Harriet Bishop Elementary School, Rochester Montessori School, Judd Park, Manor Park, Meadow Lakes (future trail), and Cascade Lake Regional Park. The number of people served by these improvements is greater the number living in Stewartville, Kasson, or Byron. In short, these improvements are intended to serve an enormous number of currently unserved people. 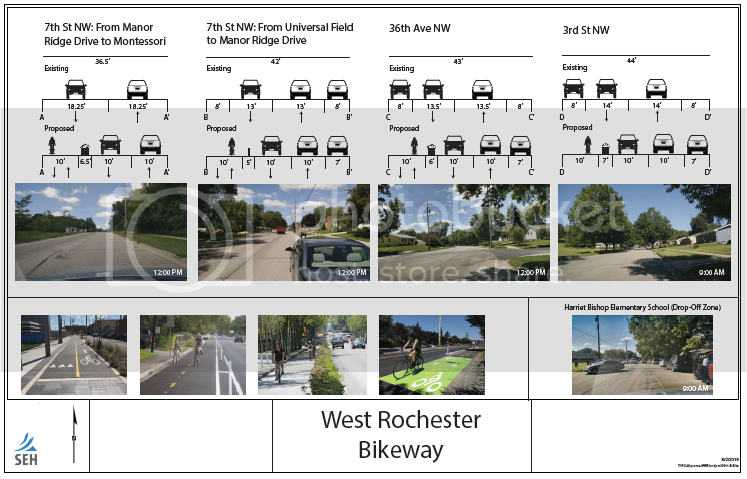 Because the main roads targeted (36th Avenue, 7th Street NW, and 3rd Street NW) are built overly wide; we have the opportunity to add bike lanes protected by significant buffers and physical separators. The current curb to curb width is so large that we can achieve this while still maintaining all current driving lanes and parking along every roadway except a single section of 7th street that has no homes fronting on it. Our hope is to also begin planning for and seeking funding for a pedestrian connection over West Circle Drive. I hope that Rochester, Olmsted County, and the School District would all participate in this effort. Potential sources of funds may include state bonding, safe routes to school, federal TAP funds, or sales tax dollars. A future four way intersection at County Road 34 and the entrance to People of Hope will serve as an opportunity to safely cross that roadway and continue this network along Cascade Creek to the South and West. Here is the original data file. I am NOT in favor of proposed bike lanes in Country Club Manor area. I have lived on 36 Ave for 19+ years. I was having a birthday party for my then 10 year old and 9 other children on the day that little girl was hit. We were in my backyard (which is facing county 22). I heard the accident and then a car stopped right behind my yard. He looked right into my eyes and then I noticed his car! The windshield was shattered with blood running down! We DON’T need any bike path on 36 Ave nor near Bishop Elementary School!! Why put the children in danger of more strangers?? What IS NEEDED is traffic signal lights at 7th and county 22! Please concentrate on providing us with that! This is important enough to me that I am happy to personally meet with you. There are lights at 7th and Highway 22, there will be lights added at 3rd NW, and 9th NW. The proposal would not use bike lanes, but rather protected bike ways which are actually safer than riding on the sidewalk when built correctly. Also what happened on June 16th 2006 was not an accident, it was reckless driving that took a life. I remember the scene after I arrived there. For a decade I have worked on safe streets for all users. That is the goal here. 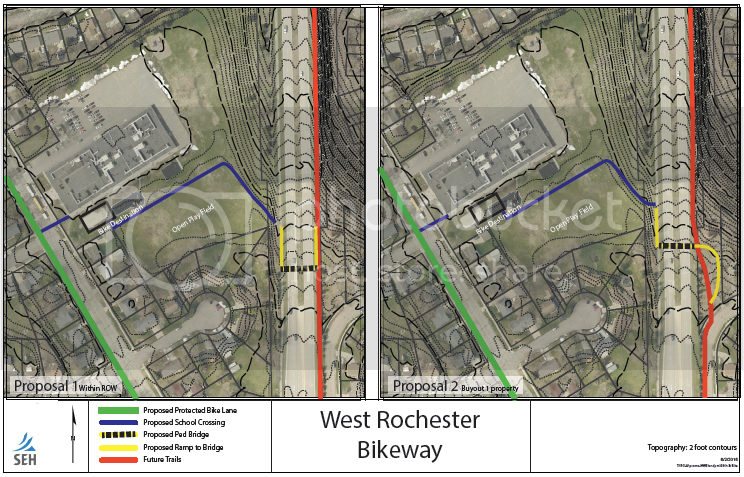 I’m excited to see Rochester possibly embracing protected bike lanes. The savings on infrastructure costs, let alone improvements in SAFETY for all, are well worth it! Our city is for all people. Not just those with cars. All people have the right to use our roads. Thank you for championing protected bike lanes.